Five people were killed and at least 151 injured in a trawler carrying 330 people illegally to Malaysia, when traffickers fired gunshots at the migrators, 12 kilometers off the St Martin’s island in south-east Bay of Bengal this afternoon. The Bangladesh Coast Guard rescued the trawler and brought it back to St Martin Island's shore around 5:00pm. The force also detained three people according to commander of St Martin Coast Guard station, Lt Shahid. "Among the three two were Thai citizens and one Myanmarese," he said, not willing to disclose the names as yet. Based on information from the detainees, another person was arrested by police from Joynagar village in Narshingdi district's Shibpur upazila, confirmed officer-in-charge of Shibpur Police Station. Starting for Malaysia on Monday morning from Maheshkhali upazila in Cox’s Bazar, the approximately 120 long boat had stopped in the middle of the sea to take more passengers on board, said one passengers who sent out SOS to different people using mobile phone and later talked to journalists over the phone. "When we protested, a scuffle took place between us and members of the trafficking gang in the trawler," said Belaluddin, one of the Malaysia goers from Coxes Bazar's Ramu. "The traffickers then called their accomplices who came in boats around 12 pm and fired at us," he said. 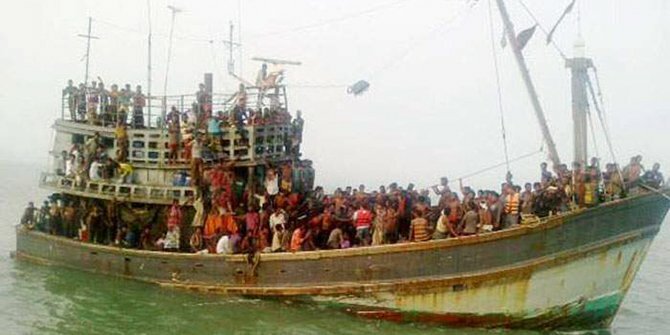 Commander of Teknaf Station of Bangladesh Coast Guard, Kazi Harun-ar-Rashid, told The Daily Star, "The armed traffickers arrived in three trawlers and fired indiscriminately at the boat which was positioned near the Myanmar border. The miscreants then escaped towards Myanmar." Rashid said they are trying to find the identity of the deceased. Getting the SOS from the affected boat, the Bangladesh Coast Guard had sent out rescue teams, who had to wait for hours for the boat to drift towards the Bangladesh boundary from the Myanmar maritime boundary. After the first Coast Guard boat reached the stranded boat, the agitated passengers at first tried to jump abroad the rescue boat. This had prompted the Coast Guard to back off its much smaller boat and call in reinforcement. After reinforcement came, the towing began but took a long time since the sea was very rough. Last year more than 250 people were killed when three trawler carrying people for Malaysia sank in the sea. The biggest incident of detention of illegal migrators was on February 11 this year. On the day Coast Guard detained 220 persons from a Malaysia bound trawler from Dakhhin Paschimer Baroshil area near St Martin’s Island. After amendment of Human Trafficking Act, 124 cases were filed in this connection in Cox’s Bazar district and 705 persons were accused in these cases, of them only 238 were arrested. The rest are still in the run. Replying to a query about illegal movements of the migrant jobseekers to Malaysia by sea route, Expatriates’ Welfare and Overseas Employment Minister Khandker Moshrraf Hossain said his ministry always discourages illegal attempt to go for overseas jobs. “We a have a law which ensures maximum punishment of the human traffickers who will passage people by illegal ways for overseas jobs. We want none becomes interested to take risk of their lives,” he told reporters while addressing in the ministry yesterday. Referring the jobseekers’ illegal attempts to enter into Malaysia by Sea boats, the minister said the Home Ministry should play vital role to prevent such movements. He, however, said his ministry would issue a circular to stop illegal passage of the people for jobs in abroad including Malaysia.